The 12 inch heavyweight single vinyl comes in a full colour gate-fold sleeve with printed inner bag and includes a free digital download. After nearly twenty five years and counting as a member of Elbow and one of the UK’s most recognised and celebrated musicians and lyricists, Guy Garvey is setting off alone for the first time. ‘Courting the Squall’, his debut solo album is, as with all solo albums, a glimpse into its creator’s soul. 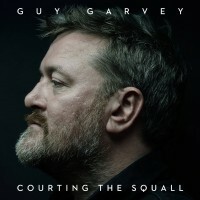 Shot through with warmth and emotional intelligence, content and comfortable in its own skin, ‘Courting the Squall’ is that most unique thing; a record made without preconditions, an album of songs made purely for the joy of its making. Andy says: Fantastic surprise as Guy rings the changes. A super album, and quite different from Elbow. Recommended.